If you have a very messy house with lots of stuff laying around on the floor like bedding, shoes with laces, towels, laundry, workout barbells, toys or furniture that is lower or right at 3 3/4″ high underneath, or a puppy that is not housebroken, yeah it happened, not once but three times! Then this is NOT for you. 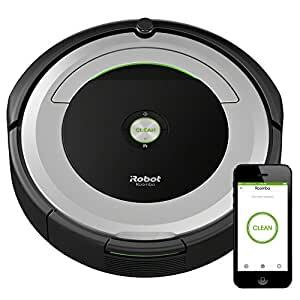 This IS for you if you are very neat and have nothing laying around, you have a cat or dog that sheds and you just don’t have time to vacuum every day, then Yes Yes Yes you will be over joyed with this robot! I fell somewhere in the middle. I vacuum every single day and steam clean weekly. I have two dogs and we are messy, still, I thought my floors were pretty clean. The first time I ran the Roomba it ran about two hours and when I emptied the tray I was shocked! It was packed with dirt, hair, bugs, (see pic) I couldn’t believe I was missing so many areas with my vacuum. I use both an upright and a canister and a steamer! The Roomba can get into corners with its three rotating brushes and best of all it can fit under most furniture! It got under my beds, bathroom vanity, most dressers, my commercial fridge, the sofa, the bar, all my tables, the dining room set, behind the recliners and what was in all those places left me speechless! I have a 2000 sq foot single level house, all tile with several area rugs. Roomba did just as well on rugs as it did on my tile. Did it do the whole house in one use, no but after a week of daily use I have to say, the floors were pretty darn clean. My cordless bagless upright had much less in it after a week of Roomba working. I love the Ap I can run it from my phone, track its run time, even send it back to the charger. As I said, in my case, I am somewhere between neat and messy and several times Roomba got stuck on a shoelace, towel or under one bedroom set that is right at its top height and got stuck under the nightstand and dresser. It was sometimes able to tilt on the edge of a rug close to the dresser and force its way underneath where it was stuck in circles and the battery eventually ran out. Also, it got stuck under the nightstand and couldn’t move and shut off. It does have an auto shut off should it jam under a dresser on a shoelace etc..good feature but if it’s in a back room I could not hear the warning sound and it could not get back to the charger. As I said, your furniture needs to be over 3 3/4″ high for this to get underneath, it did not work in our master bedroom because of this, so we keep that door shut. It did a wonderful job in the rest of the house. I love that it can sense an especially dirty area like the front door mat and automatically goes in circles spiraling outward to do an extra good cleaning in that area. You can also use the Ap to do that. It comes with a small cube that you can place in an area to avoid like pet bowls or a room. The switch can be set for two patterns, circular pattern or a straight line setting for a doorway. The unit goes back to the charger on its own unless it gets trapped in an area by clutter and runs the battery dead. This happened in the workout room several times when it got stuck between a barbell, total gym and an exercise bike, again, not for those with lots of stuff. This for me, even though I am somewhat of a clutter bug, was still worth having especially for keeping up with two small shedding dogs and a heavily used kitchen with flour everywhere. Could it be my only vacuum, no, not really, my house is too big for Roomba to keep up with, thus 4 not 5 stars. If my house was smaller and I had less stuff I would give this 100 stars, it is well worth the price for a house around 1400 sq ft. And no clutter. You do have to empty the tray every day, it is a bit messy so best to take it to a can outside. It has a spare filter but I just tapped the original one out on the can and put it back in. It has a hair cutting tool to easily clean hair from the brush. We had an incident as I mentioned with a well hidden puppy poop under the bed. No, it was not easy to clean that from the Roomba and we got a lot of practice as it has happened three times! We have become very good at taking the brushes, door, wheels etc off the Roomba and it does come apart easily for thorough cleaning but do try to avoid poo, it’s not pretty! All in all a fantastic cleaning machine I would absolutely recommend this, but only to certain people. Enter Ruby. Oh Ruby… how I love thee. I ordered Ruby on a Sunday, coincidentally the same day I talked my husband into sweeping and mopping the floors without my assistance. By Thursday when Ruby arrived, the Doggie Hair tumbleweeds and dirt were beginning to take over the house again. Ruby was easy to set up, and while she was charging for her maiden voyage, my husband and I set out to reconfigure some areas in our home where we had things stored on the floor, under beds, or cords were left in the way,etc. While we were at it, we went ahead and swept dirt out of the awkward corners into the main floor area to see how she’d do. Our home is one level, 2400sq ft mostly hardwood and tile with carpet in just the bedrooms. We do not have rugs with the exception of a bath mat in 2 of the bathrooms. Our house is older, and has been remodeled so there are a couple of awkward corners. On Day one, Ruby struggled. Oh bless her poor little drunken soul. She bobbed and weaved and missed areas and spit things back out and eventually died lost in a back bedroom. We re-charged her and ran her again. She did ok the second time, but again got stuck somewhere with a dead battery. (I emptied her dust bin a total of 5 times that day and it was incredibly full each time. For shame!!) We went ahead and set up a schedule for her, and thought If we weren’t happy after a week, we’d return her and go back to fighting and slaving over the floors and finding excuses for people to not come over. After 6 days, I can honestly say I’m in love with Ruby. Six whole days of us not touching a broom (aside from sweeping the dirt from an awkward corner into her path the first day), there is not a single doggie hair tumbleweed on our floors. My feet are pretty clean when I run around barefooted all day. I’m no longer embarrassed or panicked when someone says they’re going to stop by the house. It’s even clean under the beds and couches!!! $324.73 and WORTH EVERY PENNY!! Here are the questions I really wanted answered before I purchased, so I’ll try to answer them for you. 2. Wifi function is great for setting a schedule, and for locating her when she occasionally can’t find her way home when her battery dies, and for starting her away from home if you need to. I think we probably could have lived without this function, but I’m not sorry we have it. 4. The same dogs that are petrified of my upright Kirby and upright Bissel Shampooer don’t pay any attention to Ruby unless she runs into them. 7. She has not scratched our original hardwood floors. 10. Mopping: Originally I had planned to purchase a robotic mop shortly after getting Ruby. As the weeks went by, I noticed it was 3 weeks before the floors needed to be mopped again and frankly , I could have gotten away with a spot mop then. What we had normally spent about 20 minutes on once a week, has turned into 20 minutes every 3 weeks. So overall, we’ve traded in an average of 2.5 hours a week of our time cleaning floors each week for a new average of roughly 10-15 minutes per week between dumping ruby and occassionally mopping. Thank you Ruby!